I’m a turf kinda girl. Let me explain. Living life in a landlocked situation, fish rarely comes up on a weekly menu. As a child fish came in the form of caned tuna (for tuna fish sandwiches with mayonnaise and pickles) OR a platter of ice cold shrimp (don’t forget the cocktail sauce!). I finally ventured to make fish my last year of college and it was a frozen tilapia variety that I had no clue how to cook. That poor frozen tilapia—I probably cooked it while trying to thaw it under piping hot water from the faucet. Alas, we all live and learn and for me cooking has always been a trial and error kind of situation. As the story goes, the more I dive into the sea of cooking (I couldn’t resist the pun!) the more I find myself dabbling with the notion of cooking fish for dinner. The two underwater varieties I tend to fall back on are shrimp and salmon. Occasionally I will throw in scallops if I’m feeling fancy. However, I’m not much of a surf girl and venturing into multiple types of fish is actually intimidating. While at Market Street with the kids, we were making our ritual walk by the “sea creatures” to see the king crabs. I say hello to the fish monger, as I typically do, and he asks if there was anything he could help me with. Instead of my standard reply of “no we are just wanting to see the fish with the eyeballs and look at the king crabs,” I actually did engage in fish talk. “What’s fresh today?” I asked? He goes on to tell me about the halibut that he had just prepared. It was a glowing review. “I’ll take that, then” I responded. With no intentions of making halibut that week, I departed from the weekly menu to cook what was fresh and exciting to the Market Street fish monger. I had a good feeling about it. After grabbing some organic peppers and a jar of harissa, I knew dinner was going to hit the mark and it did. 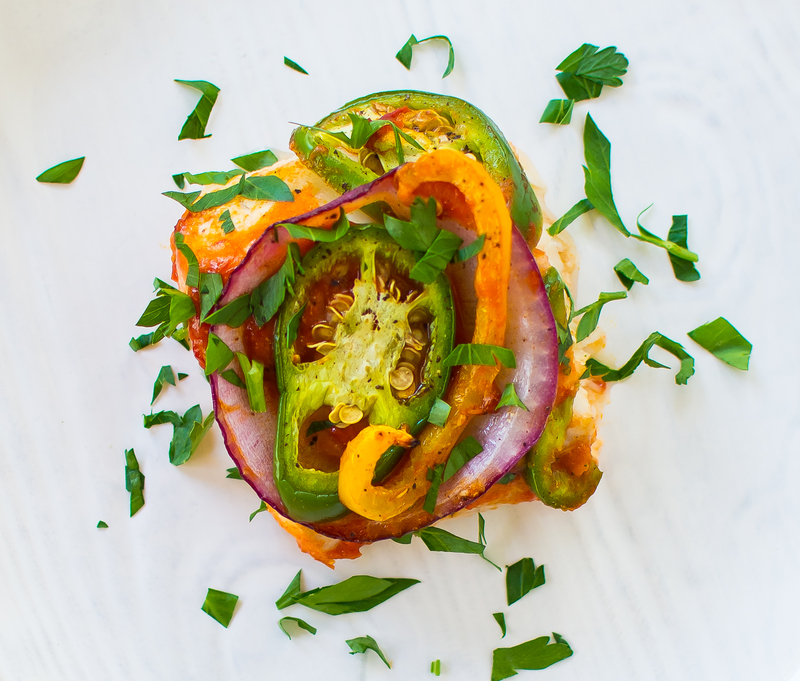 What was so great about this dish was it only took about 10 minutes of active prep time, 15 minutes of cook time and 1 minute of clean-up time (thanks to a foil lined baking sheet). 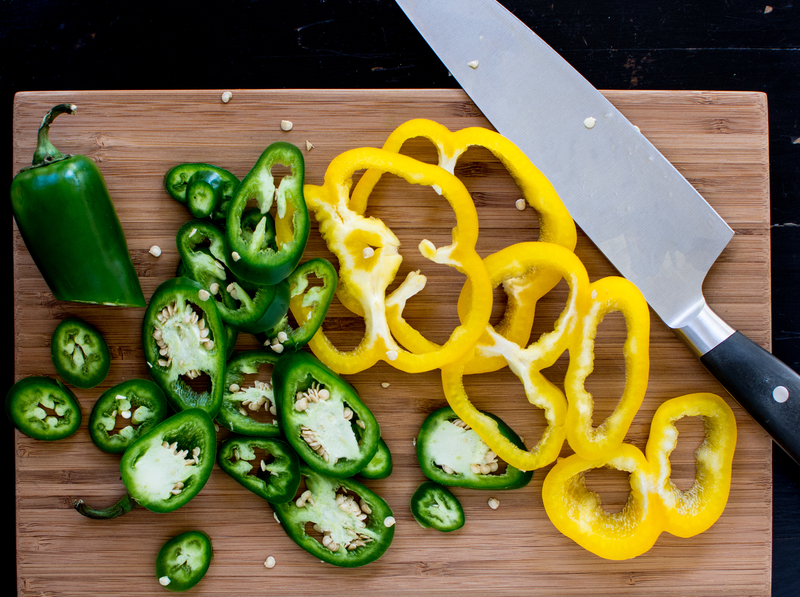 And, if minimal ingredients is important to you, this recipe has that too— only 8 ingredients. It’s time for me to be intentional with fish. 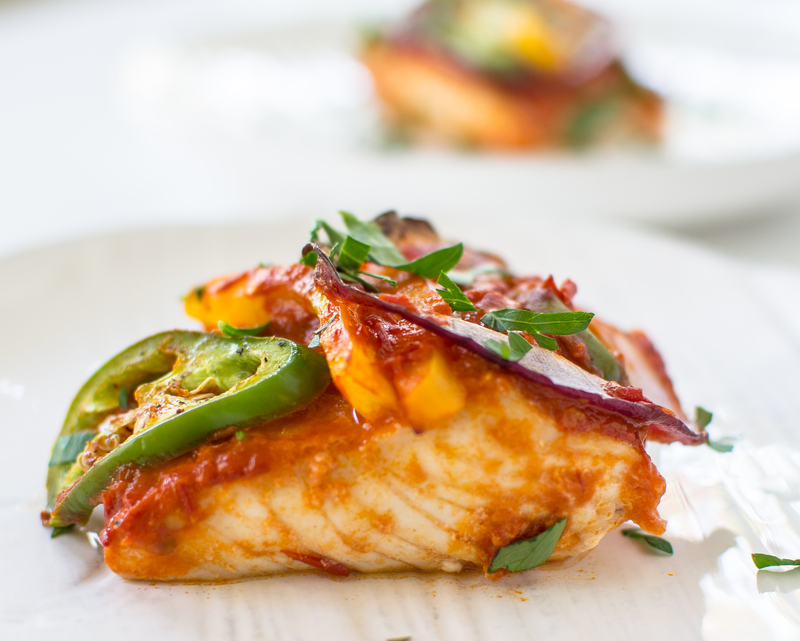 I want to turn into a surf and turf kinda gal and with simple, healthy flavorful recipes like Harissa Halibut, it’s going to be a pretty tasty and easy transformation. Author note: Fish can come in different levels of thickness. The cook time will depend upon how thick the cut of halibut is. To guarantee a perfectly cooked fish, use a thermometer. At least 30 minutes before cook time (or up to 8 hours), place the fish on a foil lined rimmed baking sheet. Add the oil and salt on to the halibut. 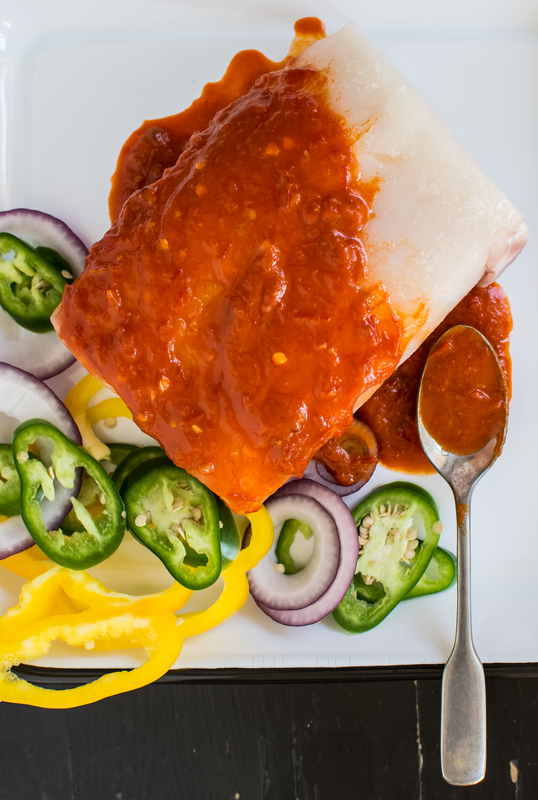 Evenly coat the top of the halibut with the harissa. Place back into the fridge. 15 minutes before cook time remove the halibut from the fridge. 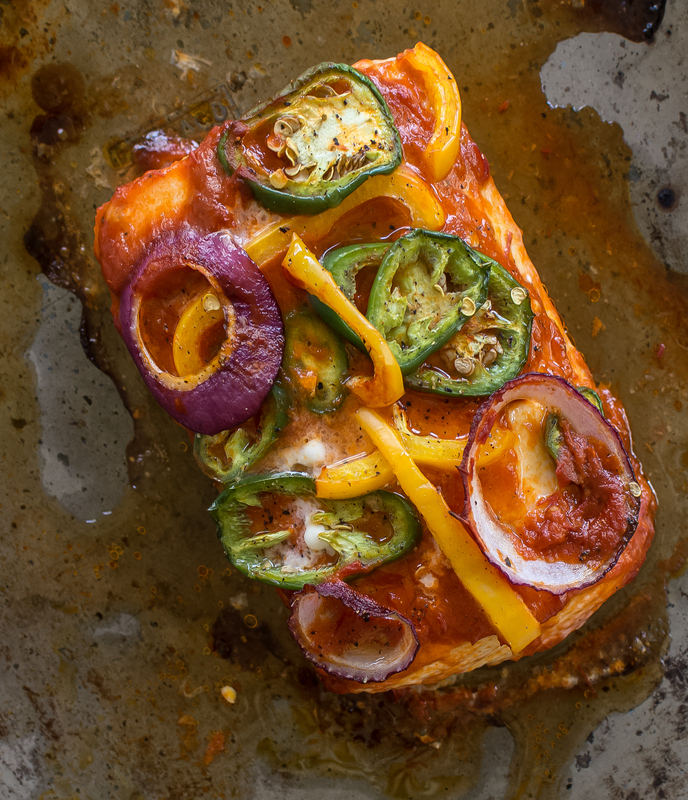 Add the bell peppers and jalapenos on top of the halibut. Place the halibut into the oven and bake for 12-17 minutes, or until the fish is fully cooked (130-135 degrees). This entry was tagged A Pleasant little Kitchen halibut, baked halibut, baked harissa halibut, dallas food blog, dallas food blogger, harissa, texas food blog, texas food blogger. Bookmark the permalink.